I had the lyrics to this song come to me in a dream... and also the music to it, which I have now forgotten. It's sort of an homage to my father. Dr. Claudia Rousseau curated an amazing show. 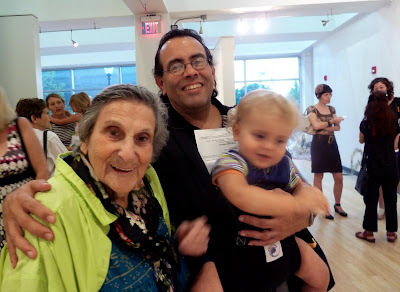 More on that later but for now, that's me sans mustache, Little Junes and the photography legend known as Lida Moser at the opening. Pic courtesy of Laura Seldman. The show is at the School of Art & Design at Montgomery College's King Street Gallery, located in the beautiful Morris & Gwendolyn Cafritz Foundation Arts Center at 930 King Street in the Montgomery College, Takoma Park/Silver Spring Campus. There will also be an artists' panel tomorrow, Monday, Sept. 27, at noon, for one hour. I will be available at the panel and after the panel to discuss and answer any questions that you may have about anything dealing with the visual arts, career, galleries, etc.